When a review copy of "A Golden Age" arrived at my door a few years ago I was very impressed with artistic elements of the cover design. I hoped that the new author of this book would not let me down. The cover design paled in comparison with the mellifluous language and emotion in this debut novel. Shortly after, it came as no surprise to me when I heard that Tahmima Anam had won the 2008 Commonwealth Writers Prize for the Best First Book. Tahmima Anam comes from an illustrious literary family of freedom fighters. 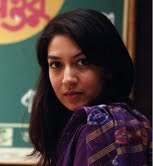 Anam was born in Dhaka, Bangladesh, and grew up in Paris, New York City, and Bangkok. She completed her undergraduate education at Mount Holyoke College in 1997. She trained as an anthropologist, earning a PhD from Harvard University, USA. In 2005 she completed an MA in Creative Writing at Royal Holloway, University of London. Besides writing fiction, she is also a contributing editor of New Statesman of UK. She was gracious enough to answer some questions for Suprose from her home in West Hampstead in London. 1. Your degree is in Social Anthropology. How did you become a writer? I decided while doing research for my PhD in Anthropology that I wanted to become a novelist. I wanted to bring characters to life, to describe a time and place and allow the reader to be transported to another time and place--in my case, Bangladesh during the 1971 war. 2. How did your first novel get published? I wrote a short story which appeared in an anthology. The editor got in touch with me and asked if I planned to write a novel. I sent her a few chapters and she liked them. She is still my UK editor to this day. 3. Why do you write? What inspires you to write? I am currently working on a story about a young boy who works in a ship-breaking yard in southern Bangladesh. I went to one of these places last year, and I was struck by the sight of these giant ships being taken apart by workers. I am inspired by human stories of suffering and resilience, and of course, by the landscape of Bangladesh. 4. Who were/are some of your role models? Rokeya Sakhawat Hossain, the 19th century Bengali feminist and writer. Her novella, Sultana's Dream, is one of the first ever depictions of a feminist utopia. And my grandmother, Musleha Islam, who raised four children in East Pakistan in the 1950's after she was widowed at age 36. 5. Who are some authors that you like to read for technique, for inspiration and for relaxation? Every time I begin a novel, I re-read Toni Morrison's Beloved, which I believe is a great modern masterpiece. I read it for style, technique and sheer brilliance. 6. Both your books are about the Bangladesh Independence movement. Did this affect you personally? What about it draws you to this Independence struggle? My family were all very much involved in the Bangladesh war. Though I didn't witness the war myself, I think of it as a moment of protean possibility, a moment when people were imagining a new country, a new society. I wanted to invoke this sense of newness in the first novel, and in the second novel, I focused on some of the disappointments that people faced once the country came into being. 7. Have you written your next novel? How long do you take to write a novel? What process do you go through when writing one? It takes me 3-4 years. I wish I could say I've already written the next one, but in truth I have hardly begun. I write my novels in longhand and then type them into the computer--it helps me to go through my own garbled handwriting and start the editing process at that stage. 8. What would you say to those who say that one needs a formal MFA in order to become a successful writer? It depends on the person. An MFA can give you the confidence and the discipline to begin writing. But many successful writers have either just begun writing at a very young age, or turned to fiction after having a career in another field. I wouldn't prescribe a formula, but I would say that it's important to give yourself the time to get started, and to force yourself to sit down to your writing for at least a few hours every day.